Michelle and I hope that you enjoyed the little ‘detour’ last week with Seth Apter. We were grateful for the opportunity to create some things outside of our normal genre of arts and crafts. 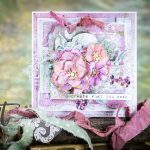 Today we are back with a quickie card using our new Die D-Lites’® Love in Flight set. I just love the colors of this card. They are so fresh and clean! (I think the stripes get me every time!) Anyway, a piece of striped paper was adhered to the card front. We die-cut and embossed the wings from gold poster board. 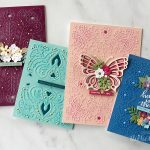 The heart was die-cut from solid card stock and embellished with a tiny white bow. Little bits of paper-punch gold circles and a splattering of gold dots with a gold pen complete the look. 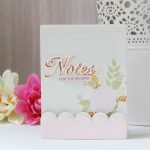 Of course, no card is complete without a sentiment and this piece was the leftover from a large piece of scrapbook paper but you could print or write your own. always, we would love to see what you have made!